I have been reading more contemporary novels these last few months and so I picked up The Upside of Unrequited. I thought it would be more about romance than it was but it was great. 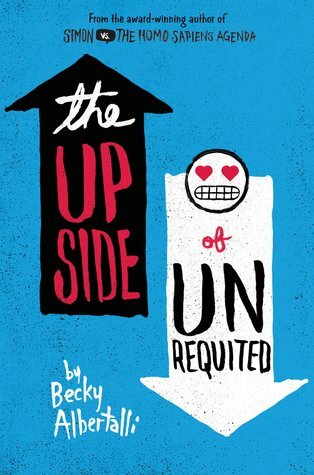 I give The Upside of Unrequited by Becky Albertalli four out of five hearts because it wasn’t as romantic as I thought it would be before I started. Although the only thing Molly, the main character, thinks about is a boyfriend, it mostly happens around her and not to her. Molly is one unlucky girl, she would like a long term relationship and the first time her twin-sister finds someone they fall for each other hard. And then Molly finally finds someone, she falls for two, the sidekick of her sister’s girlfriend and her geeky coworker. Cassie is cute, first she is cynical and then falls hard for someone. And her girlfriend also comes with a great sidekick who could hook up with Molly. They aim to get the two to like each other. Seeing Molly and Cassie together and what they do for each other is great. I really enjoyed it. The romance level wasn’t very high and that made it very enjoyable for me. The characters were flushed out and well developed. This entry was posted in Book Review and tagged Adventure, Becky Albertalli, Book Review, LGBT, Romance. Bookmark the permalink.